To select Recipients to add, simply choose how you would like to search for the talent to be added - either by Talent name, Divisions or Groups. If you select Divisions or Groups you are able to add an entire Division or Group to the casting call and delete talent you do not wish to be added. 3. a. You can select talent either by name, division or group, and by then typing their name in the drop down and clicking it. 4. In the top right corner of your page a pop up will appear to let you know you are selecting for a casting. 5. 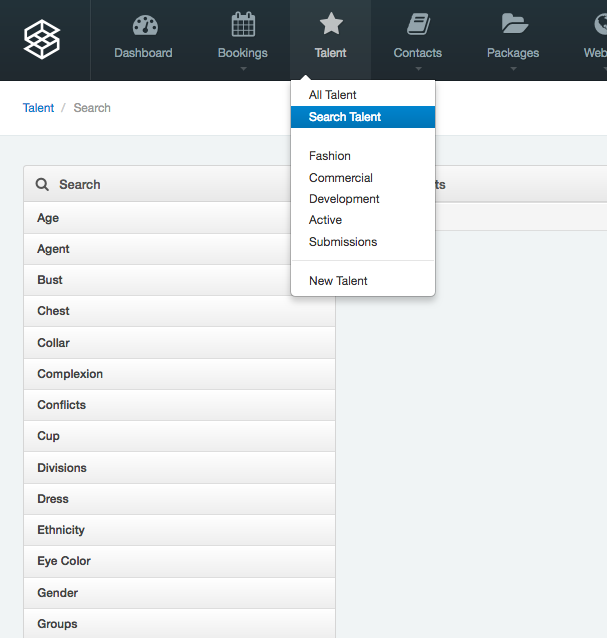 You can then use the search talent function under talent and search by gender or any other criteria you wish. 6. To add talent to your casting, click on the head shot and the blue border will appear around the headshot to let you know that they have been selected. 7. Once you are finished, click on Return to Casting in the pop up window and you will return to the main casting page. When you go into the Recipients page now you will see the list of the selected talent. Please note: it is important that each talent has a corresponding email address next to their name - otherwise they will be unable to receive the casting call email.